Tired at failing on the same resolutions year after year? Exhausted from trying to be stronger than you feel? It’s time to stop trying harder. Let the Gospel heal the deeper wounds. It’s time to get unStuck so you can move forward again. Join us Sunday mornings at 10:30 in January and February as we focus on healing those deep wounds. We’ll have special speakers and studies that will get you moving again. We’ll also be going through the book Healing is a Choice by Stephen Arterburn on Wednesday evenings. 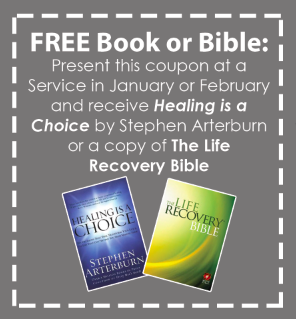 Bring in this unstuck coupon to get a free Life Recovery Bible or a copy of Healing is a Choice by Stephen Arterburn.